Pete and I were in the State Up North over the July 4th weekend. We always have a great time up there: good company and excellent home-made food cooked by my brother, Mike. And his wife, Maryjo, makes the best salads ever. I don’t know if you remember, but Mike is the Squirrel Whisperer; Maryjo can now call in the squirrels, too. Well, Pete and I got to feed a few squirrels, too, along with some blue jays, all of which love peanuts. The squirrels are usually pretty tentative when they first come into the yard. The route from where they are to the peanut in your hand is usually not a straight one. But after a few peanuts, they become more bold, coming up in a straight line to take the peanut right from your fingers. What amazed me was just how gentle they were. It could have been a fragile egg, they handled it that gently. The other really cool thing that we experienced at Mike’s house was a cicada killer, a wasp that paralyses a cicada, drags it into a hole it’s made, lays an egg on the insect, then fills the hole back in. The egg hatches and feeds on the still-alive cicada. Kinda gross! But Pete says that cicadas harm trees, and the cicada killer is just doing its thing. 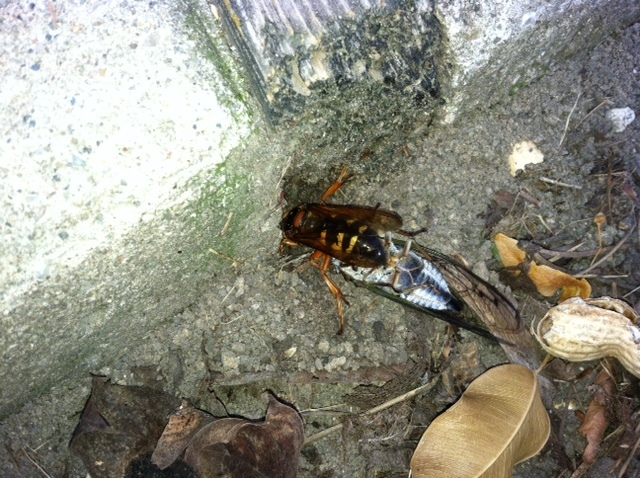 I actually thought to grab my iPhone and take a video of the cicada killer flying around with the cicada. It’s pretty amazing when you look at the size difference how the cicada killer could even make it off the ground. Once we came back from Michigan, it was off to the LOUA monthly meeting. It’s really great to hear how word of our little arboretum is spreading. Pete has seen several people looking at our tree (which in on the Indianola Walk), map in hand. In fact, he saw a couple at the kiosk and stopped when he saw they were returning a map. Seems they were from near Youngstown and had come down to the Short North to do some shopping. They saw the kiosk and decided to see what it was for. One look and off they went, map in hand, shopping forgotten. Pete said they even wanted to donate to LOUA. I still find it hard to believe that we have done something so wonderful. Thanks again for everyone’s support. Hope to see you all at the Glen Echo birthday bash tomorrow! This entry was posted in General Information and tagged cicada killer. Bookmark the permalink.